Sopchoppy, Florida, located on US319 in western Wakulla County, is “famous” for two things: One tasty and one not! The local swamps are home to a huge growth of Tupelo Poplar trees and the soil is loaded with large earthworms! 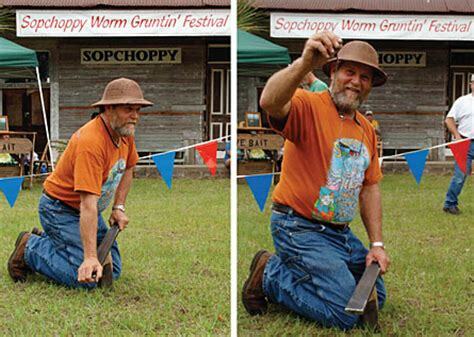 Sopchoppy is famous for Tupelo Honey, harvested by local apiaries and one of the most unusual “festivals” in the U.S., The Sopchoppy Worm Gruntin’ Festival, is also held there each April. 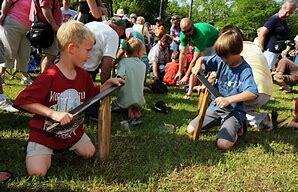 The Sopchoppy Worm Gruntin’ Festival has easily become one of Wakulla County’s most popular and largest events each year. 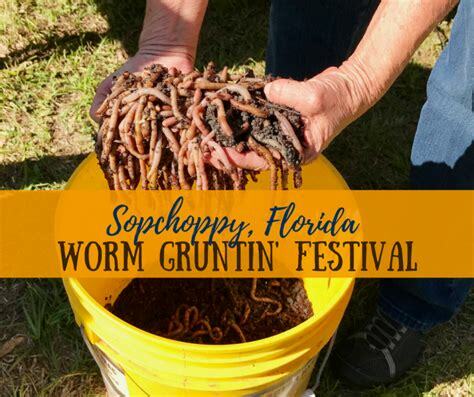 The celebration draws thousands from Wakulla County and the surrounding areas who come to see the famed Sopchoppy worms rise from the ground and crown a new Worm Gruntin’ King. This all-day celebration begins bright and early with a 5K race, then features a “Worm Gruntin’ ” demonstration and competition in the afternoon, and ends with live music late into the night. The event attracts nearly 100 food, arts and crafts vendors every year, and the evening culminates with the Annual Worm Grunters’ Ball, featuring a slew of live performances from local artists.